Dr. Graham Robson hadn’t heard of chiropractic care until reaching his mid-20s. He developed an unexpected interest in natural health after seeing a chiropractor who taught him the compelling philosophies behind chiropractic care. With a background in business, one of the last things Dr. Robson expected was a career in the healthcare field. But the more he learned, the more he realized that chiropractic offers something entirely different than traditional healthcare. 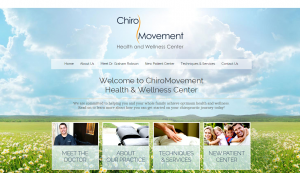 Dr. Graham, and his team at ChiroMovement Health and Wellness Center, offers services such as supplements and nutrition, postural rehabilitation, and pediatric and prenatal chiropractic care. Serving the Highland Park, TX area, the ChiroMovement team provides a comforting environment where patients can learn about chiropractic care while achieving their individual healthcare goals. Stocked with fresh content and a new mobile-friendly website design, we are excited to see Dr. Graham’s practice grow in the months and years to come!